Ross A. Clevens, MD, FACS donates his time and talent to help a bullied Florida teen. Clevens Face and Body Specialists is proud to announce a recent collaboration with a local charitable foundation to help a teen in need. Malak’s Medical and Dental Warriors reached out to Ross A. Clevens, MD, FACS for assistance with a young man named Lewis who had been severely bullied because of the appearance of his nose. 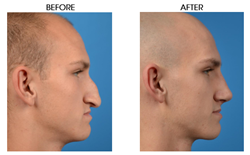 Through the nonprofit Face of Change, Dr. Clevens donated his time and skill to provide a pro bono “rhinoplasty” or nasal contouring procedure for Lewis. An award-winning double board certified facial plastic surgeon, Dr. Clevens has practiced in Brevard County for 20 years. He is the creator of the Laser-Assisted Weekend Necklift and a pioneer in the use of PRP (Platelet Rich Plasma) healing gel to speed recovery and improve patient outcomes. Trained at Yale, Harvard, and the University of Michigan, Dr. Clevens founded Clevens Face and Body Specialists. The practice offers Facial Plastic & Reconstructive Surgery, Breast & Body Surgery, NeoGraft Permanent Hair Restoration, SculpSure Body Contouring, Injectables and Fillers, Laser Treatments, Skin Cancer Care, and Medical Grade Skin Care. The practice provides comprehensive patient care at offices in Melbourne and Merritt Island. To learn more about Lewis, click here to watch a video about his story. For more information about Clevens Face and Body Specialists or the nonprofit Face of Change, call 321.727.3223 or visit http://www.drclevens.com.